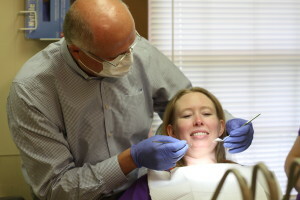 Dr. Mike Clark a toothache dentist Pine Bluff, AR believes being proactive in their oral health can help prevent toothaches, along with other dental problems. believes being proactive in their oral health can help prevent toothaches, along with other dental problems.Every once in a while, one may suffer from a toothache. There is a multitude of causes a toothache can stem from; tooth decay, an abscessed tooth, a fractured tooth, teeth grinding, infected gums, a damaged filling, or even sinus problems. Overall, toothaches are caused by irritated or damaged nerve endings that are very sensitive to pain. Sometimes, toothaches can be serious enough where medical attention is required. There are several signs of toothaches that are indicators that you should see your dentist. Some of these signs include pain with chewing, hot or cold sensitivity, bleeding or discharge from teeth and/or gums, and swelling around tooth. If you experience tooth pain for more than two days, you should see your dentist to determine cost or treatment. Preventing toothaches is not a difficult task. Through brushing, flossing, and having your teeth professionally cleaned on a regular basis, toothaches can be avoidable. When you go to visit your local dentist, he or she may apply sealants, varnishes, or fluoride, which also prevent toothaches. Taking the extra precautions to prevent toothaches will save you time and money in the long run. the Dr. Mike Clark Dental Practice on Cherry Street wants to help you today. The staff at Dr. Mike Clark a toothache dentist Pine Bluff, AR are raedy to serve you. Dr. Mike Clark in Pine Bluff wants to ensure all of his patients have their dental emergencies taken care of. We take emergency appointments – Call today!